Cycling usage in London is projected to increase to 45% between 2017-2023 and will soon overtake the use of private cars if growth is sustained. It is not only a better way to move around congested urban streets or a means to reduce pollution levels but also a great form exercise. If you are thinking of taking up the sport or increasing your cycling activity, why not include your pooch in your daily workout? Cycling benefits both you and your pet by improving cardiovascular fitness levels, keeping body weight down and enhancing overall wellbeing. Before you get on the saddle though, there are a few points to remember to make cycling safe and healthy for both rider and animal. You probably won’t go for a bicycle race with your pooch, but extended rides in the park are not uncommon if you are already on the road. On this note, not all dogs have the endurance of a German Shepherd or a Husky so you might want to assess whether your pet can withstand cycling with you. Start slow and check how well your dog can keep up. In addition, temperatures play a role in how long a dog can exert physical efforts. Before heading out to the park, check the weather forecast. If it’s going to be hot, reduce the time spent outside and test the pavements to avoid burning your beloved pet’s paws. Carry enough water so you and your pet are hydrated. 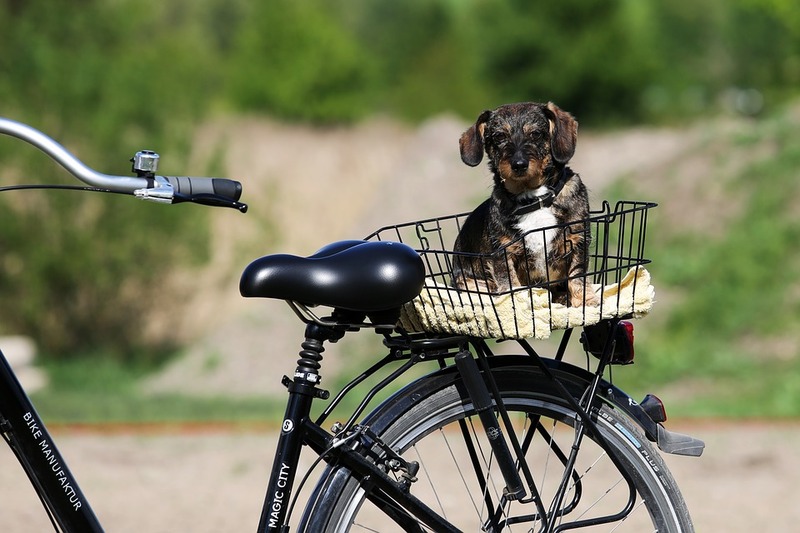 If your dog is not going to get very far when you are cycling whether they are ill, old or tired, there are options to get them to ride with you to get a breath of fresh air. Baskets and trailers are great for small dogs whilst dog trailers can carry medium to large dogs. Longtail cargo bikes and trikes are other dog-friendly options. Cycling with a dog on a leash or tied to your bike can become dangerous if your pet is unreliable or is nervous. One jolt or a careless movement can cause you to fall and your pet harmed. In addition, it will also create an unsafe environment for other riders. Thus, make sure your pet is disciplined and able to move in dense traffic in the park. Use bike or dog leashes that are attached to your bicycle’s seat post or rear axle so your hands are free for steering. Moreover, be mindful of the laws concerning bicycles. By law, they are carriages and should not be ridden on footways. Hence, if you must use the streets to get to the park, it is probably prudent to walk your bike and your pooch on the leash to avoid getting into trouble with the law. Getting on a bike with your best friend by your side is a brilliant way to exercise and to stay fit. Sticking to traffic laws concerning cycling, using proper equipment for safety and ensuring that you are both hydrated are essential for a fantastic outdoor experience. You will not only enjoy the physical benefits of cycling but will also improve moods and overall well-being.